One of the many moving pieces behind the scenes of the recent Secret Invasion was the conversation between former SHIELD taskmaster Nick Fury and Deadpool, his chosen independent mercenary. Tasked with thieving information on the identity of the Skrull Queen, Deadpool accomplished his mission, but Norman Osborn intercepted the ensuing transmission. Normy then used that intel to take down the queen himself in a bold (and successful) reach for power. Now Deadpool wants his money, Fury ain't paying up, and Osborn is ready to move on. In an effort to rid himself of the hassle in one fell swoop, he's sent one of his most skilled Dark Avengers, Bullseye (in the guise of Hawkeye) to personally take care of our little red merc once and for all. 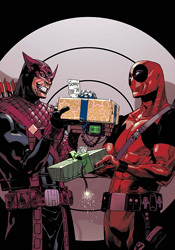 At least, that was the plan before he caught a meathook to the belly and woke up in the ICU with a little love note from Wade Wilson in his "get well soon" flowers. Now feelings are hurt, prides are wounded and jobs are dangling in the balance. Daniel Way's writing in the buildup to this final, ostensibly climactic fight between the two has been terrific. It's given us a closer look at the competing motivations behind the twisted psyche of the Kingpin's former assassin, delivered an average of three near-death situations per issue, and never let up on the gas pedal the entire time. When the two finally meet to finally settle this thing around the halfway point of this issue, it's like a powder keg chilling out in the middle of an unsupervised boiler room. While that big confrontation is over and done with faster than you'd think, the few iconic freeze frames it delivers in just a handful of pages are good enough to make the whole thing worthwhile. The big payoff may seem cheap at first, but starts to make sense as it settles in. And just as you're beginning to come to terms with that situation, the issue's jarring cliffhanger blindsides you. Nothing is out of bounds in Deadpool. That idea is reinforced time and time again, but every single time I think I understand, I'm left with the realization that I haven't a clue. My only concern is, after this one, I don't know how much further it can really go. Despite a few obscure hiccups (why did Norman Osborn's arms shrink by about two feet in-between panels?) Paco Medina's artwork makes a great compliment to Way's storytelling. Every bit as frenetic and eccentric as the title character himself, Medina's work rarely stops to take a breath. It's filled with ongoing visual puns, touches of personality and all-around enthusiasm. The influences of J. Scott Campbell in his prime are hard to ignore, but Medina has taken that inspiration and improved upon it, perhaps solidified it. Campbell's work always had an excess of energy and action, which Medina clearly retains, but it often felt unfinished and unrefined. The Deadpool mainstay's work seems more secure and intentional in action. He can be loose and goofy when it's needed, (and it's needed a lot) but also balance it out with an air of composure when the time is right. He brings both to his interpretation of Hawkeye, and that really helps transform him from just another foil into a legitimate counterpart for the rambunctious title character. Just about every time I've sat down for a visit with Marvel's merc with a mouth, I've closed the last page with the sense that I'd just endured the final dip of a madly enjoyable roller coaster. That doesn't change here. Deadpool and Bullseye make for some wild action scenes, some intense situations and one hell of a crazy brawl, and at the end of the day there's no questioning who came out on top. Medina brings good artwork, Way keeps pushing the limits of good taste, and Deadpool keeps reaping the benefits. Loads and loads of fun. Buy it if you like watching the crazies bounce around inside their padded room.